A car crash can leave you confused, hurt and upset. If you know what to avoid doing after a wreck happens, though, you can start taking the right action to protect your rights, as well as an upcoming claim for compensation. In general, here are the most important mistakes to sidestep in the aftermath of an auto (or traffic) crash. Mistake 1 – Not reporting the accident to police. Issue an official accident report that can also help establish fault. Mistake 2 – Not taking pictures of the crash scene. The nature and severity of the damage caused by the wreck. Consequently, photos can go a long way to proving liability. They can also be helpful to establishing the value of a claim by depicting the extent of the damage. 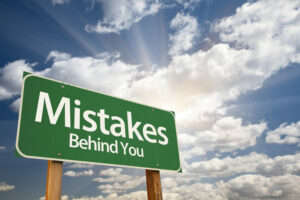 Mistake 3 – Apologizing after the crash or admitting fault. Apologies and admissions of fault can serve as a basis to argue that you are liable for the crash. As a result, these statements can hurt your claim, possibly reducing its value (or preventing you from being able to collect compensation for your losses). So, be very careful about what you say after the wreck. Though you may want to be compassionate or sympathetic to other parties involved the car accident, do so without saying “sorry” or accepting any blame for the wreck. Mistake 4 – Not seeking medical attention. The crash did not cause your injuries. Some other, subsequent event could have caused them. Even if the crash may have caused the injuries, your injuries must not have been that bad because you didn’t seek medical attention until much later. Mistake 5 – Not contacting a lawyer to find out more about your rights and options. An attorney can be an invaluable advocate after a wreck. That’s because a lawyer can inform you of your rights, explain the recovery process and help you take the right action to position your claim for success. Not having the financial resources you may need to cover future medical treatments and fully heal from the crash. If you or someone you love has been hurt in an auto crash, contact a Fort Wayne car accident lawyer at Finderson Law, LLC to get answers about your potential claim. Call (260) 420-8600 or email us to set up a free consultation and discover more about your legal options for financial recovery. Let us explain how our representation can make all the difference in your claim. Our history of exceptional representation and results with car accident claims has earned us a 5-star rating on Facebook.